This shows an Earth-like planet floating in space. Land and sea are rather arbitrarily separated and on the land we see tiny flowers in addition to the trees. The scale of the trees is much exaggerated so that you can see the ones at the "south pole" pointing down, etc. 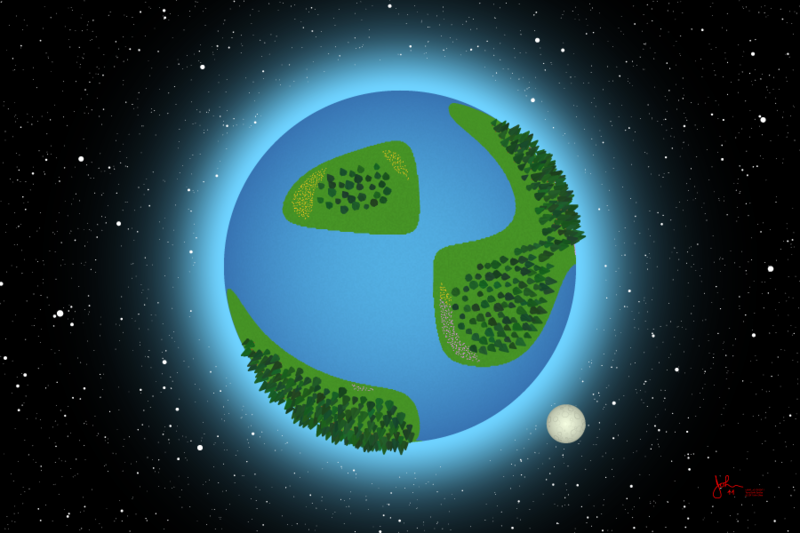 I have sometimes thought of our planet this way since it is taught in school, but here it is drawn in detail. Astronaut photos of Earth from space look something like this. In some respects this can be viewed as an exercise in the use of spherical coordinates. Each tree is modeled in 3 dimensions so that you can see the foreshortening etc. which tells the viewer that the "vanishing point" is at the center of the sphere.